Purchasing of Our Book "Great Pennsylvania Amusement Parks Road Trip"
E-Book Distributors of "Great Pennsylvania Amusement Parks"
With just over two days left of voting, we have the Phoenix, Magnum, and the Beast in a dead heat in our stacked "Favorite ACE Coaster Landmark" poll. Several others are not too far behind! Be sure to vote on the right-hand side of the page. Additionally, we have added a new page with quizzes! The link is at the top of the page. Check back frequently for we will consistently add new quizzes. Test and improve your knowledge! The announcement of Fury 325 the other day reminds me of another project that captivated my mind. I was disappointed in the loss of Dorney's Hercules at this point a while ago, but was captivated by what could replace that giant. So today I found some stuff deep in my archive from my excitement about the building of Hydra. This was one of the first coaster projects with a more modern internet presence. There were continual construction updates online, along with the use of a webcam. 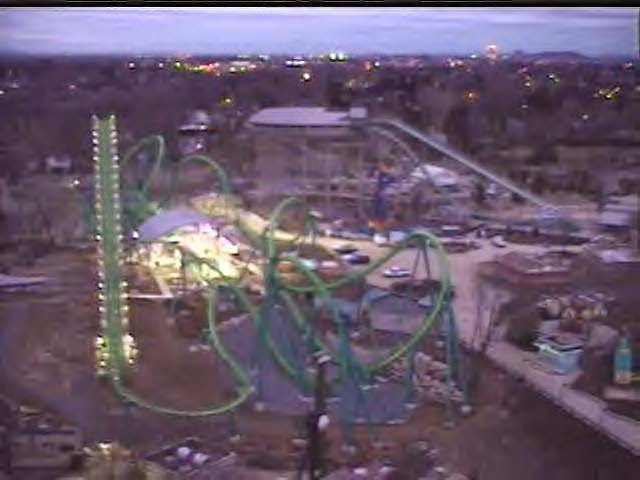 The park also came out with a top notch POV video, utilizing the same program they still use for previews today. These are some photos that I saved from the park's postings. These days I do not watch the webcams too much, but the novelty of it back then made it pretty exciting. 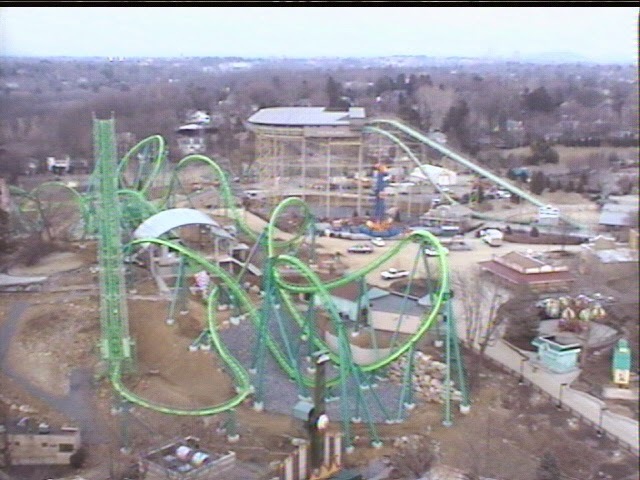 Here is a view from the first ride for the park staff back then. 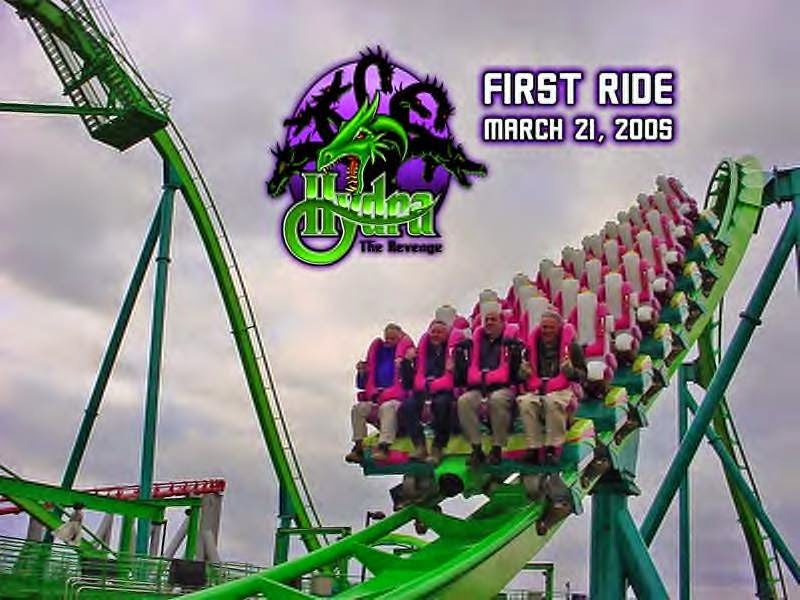 It is hard to believe that we are approaching a decade since Hydra opened! There was lots of excitement for the opening of the ride. The ride that it replaced, Hercules, was removed in 2003 and from the moment the ride closed, we were eagerly anticipating the replacement. The park was very creative in the naming/mythology for the creation of Hydra. If you are familiar with Greek mythology, the great Hercules killed the seven headed monster, Hydra. 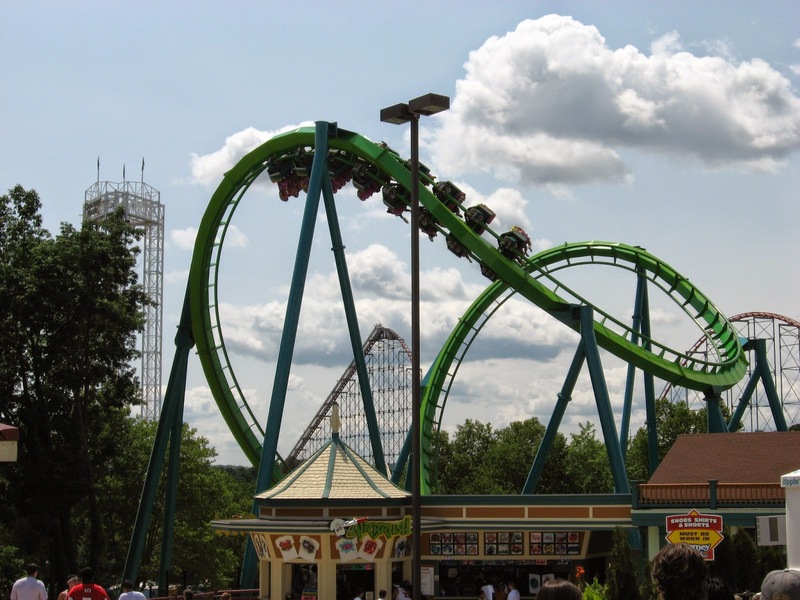 In Dorney Park Mythology, they came up with the idea that Hydra came up from the dead and took out Hercules. The ride has seven inversions, one for each head of Hydra. Here is a look back at Hercules, the ride that Hydra replaced. When it was built in 1989, it was the world's tallest wooden roller coaster. I spoke with the Weinstein's a while back, the family that owned Dorney Park throughout the 1980s. They sold the park to Cedar Fair in 1992. The Weinsteins had a large wooden roller coaster on their minds from the moment they were in control of the park. They hired Summers and Dinn to build Hercules. The coaster utilized a large hill to make the ride's then world record, 151 foot drop, while only having to be 95 feet tall. In my personal opinion, the drop right out of the station, the lift hill with a view of the drop, the turn at the top, the huge drop, the turn over the lake, and the drop under the station, were great. Other areas of the ride were slow paced and rough. It needed changes. Changes were made throughout the life of the coaster, but they were unable to improve the pacing of the coaster and the tearing up of the track. The coaster was quietly closed in September of 2003, and demolition started immediately to build Hydra. The following photos are from RCDB, for this was before I had my own camera. 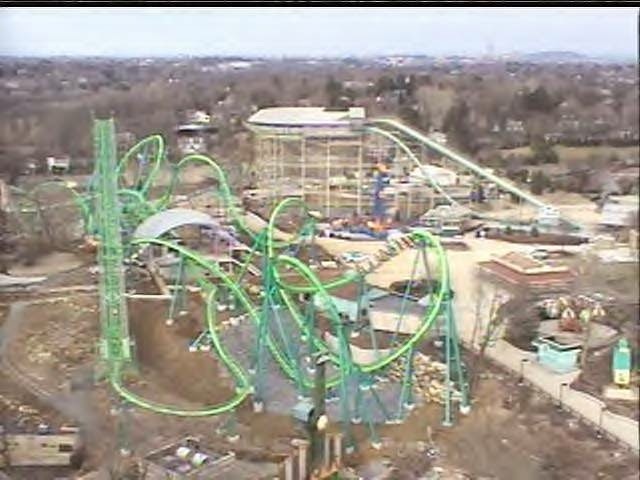 The following picture is not a perfect match with the vantage points seen above, but you can see how Hydra only utilizes the top of the hillside. Near the bottom of the Steel Force helix, and to the right, out of the view of the picture, is where the Thunder Creek Speedway Go-Karts ride. This has been closed. Additionally, the bottom of the Hill that Hercules utilized is relatively open. I would love to see something utilize the bottom of that hill again and perhaps use the support cutouts from the old Go-Kart track to get through the helixes. I doubt that this is possible, but it would be cool to see. Maybe a terrain Premier launching coaster, a Zamperla launched Moto-Coaster, or a terrain wood coaster? They could put the station near the trout pond. Another option could be to take out the White Water Landing water ride, seen standing near the middle of this picture. This ride is popular and photogenic, but it is aging and only gets utilized during the warmer times of the year. I would imagine this plan would have problems passing through the difficult local government, but it would be cool. This would be a great spot for another coaster, along with the areas on the other side of the property. Those are the more likely spots for new coasters. This was a"deep cut" from my archive of photos. It is hard to believe that all of this is approaching ten years ago! We really love Conneaut Lake and it is greatly improved each time we go! It seems like each time we go, another ride is operating again and the place looks a bit cleaner and more lively. Additionally, each time we go it seems that the Blue Streak is slightly better. It is in really good hands with the Adams and a project of this magnitude is no easy feat. I really hope that a solution can be come to, because I feel that if the park continues to improve at this clip and the debt burden is resolved, this park should thrive as a solid and affordable place to spend an afternoon or weekend. Conneaut is a park that has really grown on me. The weather today was exceptional as well. Here are write-ups from our other two visits this season: June Visit and July Visit. I really did not have a penchant for centering my photos today, in case you haven't noticed! We arrived at opening and were greeted by the Flying Scooters and the Paratrooper! Cannot wait to get some Blue Streak laps in! We saw the Roller Ball game open and had to stop. Brit won by about five feet. Our first stop was the Devil's Den gravity fed Darkride. Fun as always! I am very proud to have helped restore this. Lenny from Conneaut and Adams Amusements did even more work on it last offseason and it is pretty awesome. Taking a look over at the recently repainted Kiddieland sign. Little did I know that was our friend Mike walking through there. We would end up chatting at the Blue Streak and taking a ride together. Today they even had the famous pony rides running! Whenever you talk with someone who grew up at the park, one of the first things that their memories go to is those pony rides. I hope that children of the future are able to make those same sorts of memories at the park. Drop time! One of the coolest things about the Devil's Den Darkride is the fact that it is basically a roller coaster. Getting ready to drop again! We were about to hop on, so no photo of that car dropping.....Oh well! Now onto the Blue Streak! We started off with a front seat ride, which was awesome as always. We ran into some of our friends, including Eric, as they were heading back from their excursion to Wildwood and the rest of Wildwood, NJ. ....And heading back on the next ride was our friend Mike and his crew! We would end up taking a backseat ride together. The backseat ejector airtime was especially fantastic today! I held my arms up as I always do, but this time the airtime was so intense that I quickly put my arms down and held on for dear life! It was absolutely awesome! Mike said that the coaster was easily one of the best he has ridden. I have to say that I agree with him! The coolest thing about roller coasters is the fact that there are just so many awesome choices out there. Blue Streak's intense ejector airtime today was easily among some of the strongest I have ever experienced. After strolling the midway for a while and checking out the band down in the grove by the beach, we headed back to take in the turnaround on the coaster. They recently did work on this section of the ride and it really shows. Lots of fresh wood! With this work, that one twisted airtime hill transition thingy, my least favorite part of the ride before, was definitely improved. The quick lateral forces on it were pretty awesome. We hope to be able to get back to the park for their Ghost Lake Halloween Event. That should be pretty awesome and we hope everything works out for it to go on again. As usual though, for us, we cannot make a stop at Conneaut without taking a slight trip west on Route 6, the Grand Army of the Republic Highway, the famous Route 6, and going to feed the fish and birds at the famous Linesville Pymatuning State Park Spillway! The sign says we are pretty far from Coney Island, where we were just last week! I would like to take a road trip sometime from end to end on both Route 6 and Route 30, but that will have to wait. "Where the ducks walk on the fish"
So we opted to head to Coney Island for a lazy Sunday. There is nothing more American than Coney Island. The 150 foot Wonder Wheel is said to have actually been the first sight of America for many immigrants coming into Ellis Island, even before they saw the Statue of Liberty, and with our nation being one of immigrants, this is extremely important. I never got to ask my Slovak grandfather, who came with his parents at three years old, what his first sight/memory in America was. Both sides of my family immigrated in the 1920s from Eastern Europe and went through New York. The thought that the first sight of America for many immigrants was the Wonder Wheel is really special to me. The street views of the different parks that make up "America's Playground" are pretty dramatic. You still do not get a very good sense of what makes up the place from street view. I was not sure what to expect from this quirky place. Below you can see the world famous Coney Island Cyclone, possibly the most famous coaster to have ever been built. The 250 foot parachute drop is quite a sight to see. I can only imagine what this giant looked like when it was running. It was built for the 1939 World's Fair in Queens and rebuilt at Coney Island in 1941. The ride ceased operations in 1964 with the closing of Steeplechase Park, the place in which it was assembled. The ride remains as the only vestige from this park. The tower was said to operate for a few years afterwards on a sporadic basis, but the ride has remained out of use for over four decades. Recently they have painted the tower and installed a state-of-the-art lighting package. The first stop for us was the brand-new Luna Park Thunderbolt! The coaster looked awesome to me, but I still was not quite sure what to expect. The same goes for Coney Island in general. This place is quite a gem and it lives up to the name "America's Playground." It is a place where everyone can just hang out and relax. The boardwalk is huge, the beach is huge, there is a lovely fishing pier, lots of food concessions, karaoke on the boardwalk, some fun rides, and lots of history. The B&B Mangels/Illions/Carmal "carousell" with two l's, is beautiful! When the carousell's operator passed away in the 2000s, the unit was purchased by the City of New York and sent away for restoration. It reopened just last year after 8 years of meticulous restoration. Dozens of layers of paint were stripped from each horse, and the finer details of the horses shone through once more. This beautiful carousel makes for a cool centerpiece between the amusement parks area, the beach, and the ballpark next door. This must be a really hopping center on a day with a baseball game. The carousel is really stunning and the only one that remains of the many greats that once resided in America's Playground. Now back to the Thunderbolt. This is a terrific ride that really goes by you like a whirlwind. The vertical lift hill is fast, the 125 foot vertical drop feels huge, the loop also feels giant and the large zero-g roll (pictured). I especially love the zero-g roll because it offers a really great zero gravity feeling, along with some airtime heading in and out of the inversion. This is followed by a very large "Stengel Dive," which in my fancy terminology I call the "we're turning now" element. It is essentially a corkscrew that never inverts, but rather turns bank. It is a mixed of an over banked turn and a camelback hill. The perfect pacing of the ride allows you to really enjoy this element and get some great airtime. The turnaround element is a dive loop, which leads into a small corkscrew and a series of camelback hills that provide some terrific airtime. The ride has a really large drop, a perfect speedy pace, some large, fun, and airtime-filled inversions, along with tons of airtime all around. I was not sure what to expect with this ride, and it blew my expectations. The track length is only 2000 feet, but it felt much longer than that. At no point does this ride's pacing fizzle out. It is something of a rarity in a looping coaster in that it is built as a straight out and back ride. I really enjoy this aspect of the coaster in that it is pleasing aesthetically, making the 2000 feet of track stand out for how long it is, in addition to feeling similar to the pacing of a hyper coaster or a wood coaster. Sometimes modern looping coasters seem gimmicky or have moments of roughness. This coaster has quite a few elements to it, in addition to being very smooth and having TONS of airtime. Upon sitting in the train I was not sure of what to expect because the restraints and seat were 100 percent fiberglass. They molded the lap bars and seats pretty well in order to maximize comfort. They also have two shoulder straps that are pretty much thin seat belts that you only feel during moments of extreme airtime. Overall, I enjoy Thunderbolt very much. It is definitely a home run for Zamperla and the park. As you may or may not have been aware, the Luna Park portion of Coney Island is leased by Zamperla and utilized as their prototype debut area. There is TONS of room around the Coney Island area and I hope to see Zamperla keep building these breathtaking new coasters. I also hope to see a park or two add one of these new designs from Zamperla. Thunderbolt offers an experience as good as any modern sit-down looping coaster out there. One of the first additions that Zamperla added to the park upon taking up the lease was the Soarin' Eagle. It was relocated from Elitch Gardens. The coaster's spiral lift hill is really pretty interesting. I like how Zamperla has added names that hearken back to old attractions at Coney. While they bear little or no resemblance to the rides of old, it is cool to see them appreciate the past through naming rides in this manner. The Steeplechase hearkens back to a coaster in which riders would ride on horse-shaped vehicles. On this Zamperla Moto-Coaster the cars are shaped like horses and the riders are launched into a series of helix elements. In the background you can see the awesome Deno's Wonder Wheel! Going to Coney is almost a ritualistic type of experience. You cannot go to Coney Island without getting a hot dog from Nathan's World Famous. It looks like we just missed the Fourth of July Hot Dog Contest. There is nothing much more American than Coney Island, Nathan's Hot Dogs, the Cyclone, and the Wonder Wheel! Now to see the fortune teller. I suppose that Tom Hanks has grown "Big" again now. I still need to get to Rye Playland to see the place where that funny movie was filmed. Onto the Wonder Wheel! The outer gondolas are stationary and the middle gondolas loop around on tracks. As thrill seekers, I am sure that you can predict where we decided to ride. Needless to say, Brit and my sister were terrified! I spot the Cyclone! Not quite time to ride it yet! I also spot a Larson/ARM Vertigo Swing Tower. These are my favorite of the swing tower genre. They are better than both the Windseekers and Star Towers and they are a fraction of the height. You may be more familiar with the Larson/ARM drop towers that are at places like Knoebel's, DelGrosso's, Waldameer, Myrtle Beach Family Kingdom, and others. Just as their drop towers are the most intense of their genre and a fraction of the height of the competition, the same is true for the swing towers. I would love to see more of these around! I am brimming with excitement to ride the Wonder Wheel! I am all about shifting back and forth to get the maximum swinging effect. Needless to say, Brit and my sister Taryn were terrified! Below is the old Astroland Rocket. It was taken out of Astroland when the park closed in 2008 and it is being rehabilitated for future use as we speak. It was returned to the park this summer. You can see a similar old rocket simulator at Dutch Wonderland in Lancaster, PA. The views from the Wonder Wheel are amazing. The view of the Manhattan Skyline, including the brand new One World Trade Center. Getting closer to the Cyclone! The views from the Wonder Wheel are amazing! The Wonder Wheel, created by a company called the Eccentric Ferris Wheel Company in 1920, is the last of its kind. A remake was made for Disney's California Adventure in 2001. I was mesmerized with the Thunderbolt, if you have not noticed. I like the vertical signage. The views from the pier are beautiful! I took all of these pictures, but did not take one from the pier. It was a cool place, with lots of people sunbathing and fishing. The overall experience in the beach area is awesome. The beach was very popular. It, along with the boardwalk and pier are all free, allowing for a great and affordable day at the beach. You can opt to ride some rides if you please or eat some great food, while just relaxing. The sand at the beach is very clean and there are multiple water play sprinklers and sets of playground equipment. The relaxing aura of this area is truly one-of-a-kind. The park's feeling of being in the city, mixed with a beach resort and amusement park area make this place unlike any other. It looks crowded, but once you got down to the beach it did not feel that way. I love that zero-g roll! Almost to the legendary Cyclone! But first to the ice cream stand. This "out of order" sign is definitely the most distinctive that I have seen! I love the edge of the people in New York City. After living in Allentown, PA and having a mix of Philly and New York attitude and culture, I felt at home with the slight edge that the people have, if that makes any sense. The Wonder Wheel is stunning both on and off of the ride. Now onto the world famous Coney Island Cyclone! But not before I look at the park's awesome Larson/ARM Vertigo! The ride was running really fast and providing the awesome and twisted ride that everyone raves about! This 1929 coaster is the only project built by Keenan that remains, and one of only three that were involved with Baker to remain as well. GCI (Great Coasters International) has vastly improved the ride over the last few years to be smoother and give a better ride experience after changes were needed. I am happy to say that the ride runs absolutely amazing these days! This coaster is also an ACE Coaster Classic and ACE Coaster Landmark. If this is your favorite ACE Coaster Landmark, be sure to vote for it on the right-hand side of the page. If it is not your favorite ACE Coaster Landmark, vote for another! The beautiful entrance to the park! Home of the famous side-shows! A remnant of the ugliness that used to pervade the area. This sign for the bumper cars cracked me up! This ride is pretty cool for it allows you to ride the bumper cars in almost total darkness. Heading out, but I had to take a photo of the train in my favorite element on the ride, the "we're turning now" Stengel Dive. It is an element that almost feels like an inversion and offers a ton of airtime. Great ride! Take the trip to the park. The only consideration I have is to take in the whole experience. The beach, fishing pier, and boardwalk are free to roam and enjoy. The coasters are slightly expensive, so do not expect to be riding the entire time. With that being said, there are so many awesome things to do at Coney Island, "America's Playground" and you will not be disappointed. Go and check out this one-of-a-kind, bucket list, type of place. You will not regret it! Roller Coaster Calendar 2017: Available Now!